The Bosch GWS18 V-45B14 18 V 4-1/2 In. angle grinder kit pairs the ideal cordless grinder for pros who need unleashed performance and the CORE18 V battery – the best-built battery on the planet. With its four-brush motor design and optimized gear structure, the GWS18 V-45 grinder produces 10,000 no-load RPM. It features a two-position vibration control side handle for better handling. It is designed for long life, with overload protection and lifetime brush design. The CORE18 V 6.3 Ah battery provides more power than the previous-generation batteries, delivering performance comparable to competitor batteries that are up to 35% larger. 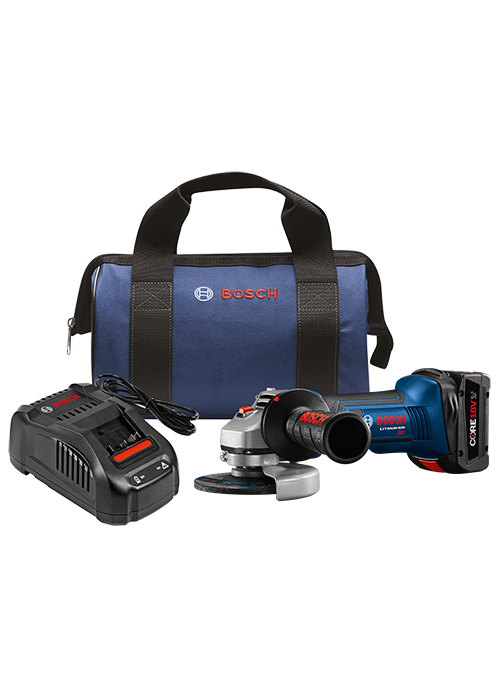 It features CoolPack 2.0 technology for longer battery life, and it is backward and forward compatible with all Bosch 18 V tools and chargers.